The Schwinn Arrow lets you take your baby out during your run with a jogging stroller actually designed for jogging and parents who want to share their love of exercise. Customize the adjustable handle to give yourself the perfect push angle and start on your way. The polished wheel ball bearings reduce rolling resistance and the air-filled tires grip the road wherever the path may lead. During the ride, the spring shock suspension smooths out rough roads, which is wonderful for both you and your baby. The stroller's premium seat cushioning and padded strap covers also help provide an extra-comfortable ride for your little one. Open up the extra-large canopy with a UPF 50 rating to easily provide shade and protection from the sun. The canopy also includes a flip-out visor for extra protection when needed. The flap behind the canopy can be rolled up to reveal a large mesh panel that provides better airflow on hot days. The Arrow Jogging Stroller features streamlined storage for a smooth running experience with no bulky trays to get in the way. The roomy storage basket gives you extra space for any larger items you may need along the way and includes two pockets to help keep smaller items easy to reach and organized. The child's seat also includes an integrated storage pocket that's perfect for a sippy cup or small toy. When your run's done, the stroller folds down easily for storage or stowing in the trunk. 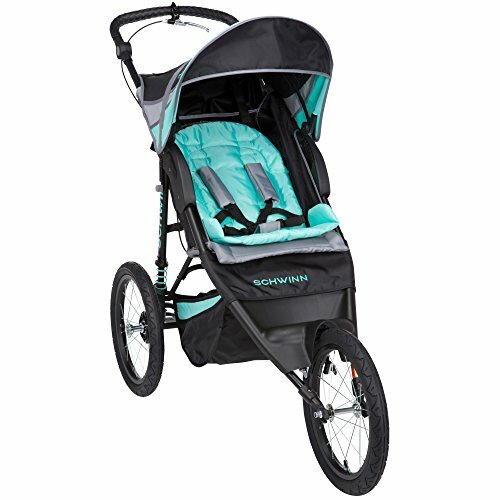 The Schwinn Arrow Jogging Stroller: Enjoy the run.